Mood imbalances, even in the most modest sense, can keep us from functioning at our best. St. John’s Wort, a perennial extract that blooms from June to September has been shown to help support a positive, balanced mood state. It contains a number of potent compounds such as hyperforin and hypericin that exhibit antidepressant, antibacterial, anti-viral, anti-inflammatory and antioxidant properties. These compounds raise the release of specific neurotransmitters such as dopamine, norepinephrine, and serotonin, that modulate brain signals between cells and play a significant role in the optimal functionality of our nervous system. Hypericin in St. John's Wort may also be capable of inhibiting a bodily chemical, monoamine oxidase, which is associated with anxiety and depression. Consequently, this herb induces the sense of well being that is very helpful for mild to moderate depression, mood swings, low energy levels, and chronic fatigue. 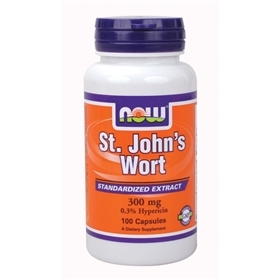 St. John's Wort is especially known for its anti-depressant activity. It is a popular herb that has been used for thousands of years as a painkiller or sedative, as well as to treat numerous conditions including burns, bruises, mood swings, sleep disorders, malaria, lung and kidney problems, tuberculosis, uterine cramping, PMS, hemorrhoids, peptic ulcers, G.I. problems, hangovers and alcoholism. Recent studies have found that St. John's Wort may also help Parkinson's disease, chronic fatigue syndrome, arthritis, nerve pain, depression, anxiety and mental disorders. The typical dosage that is recommended is 300 mg, 3 times daily. Free of:sugar, salt, soy, yeast, wheat, corn, milk, gluten or preservatives. Other Ingredients: White rice powder, magnesium stearate, silica. Warnings: Do not exceed 3 capsules daily, unless directed by a health care professional. Larger amounts may contribute to photosensitizing reactions (skin reddening) in the presence of strong sunlight or tanning beds. If you are pregnant/lactating, or are taking any MAO-inhibitors or other anti-depressant medications, consult your health care professional prior to use.